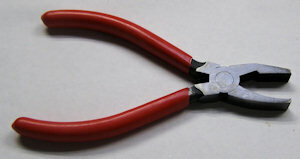 Apart from a glass cutter, the two other main tools required for cutting glass are running pliers and grozing pliers. 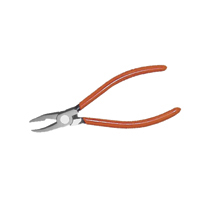 Running pliers have a curved jaw that allows for more control when making long or more difficult breaks of the score line. 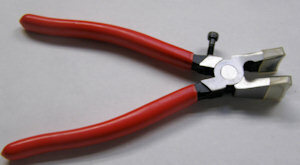 Grozing pliers are used for removing pieces of glass too small for running pliers or your hands. They have a curved lower jaw and a flat upper jaw, both with serrated edges. 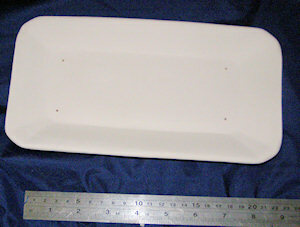 They are used with the flat jaw on top of the glass.